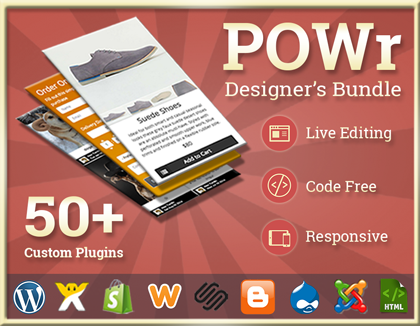 Run websites like a boss with help from POWr Plugins. Used and trusted by over 500,000 sites and counting... Remind me what's stopping you? Forms - automatic email alerts, downloadable results, payment processing. Galleries - photos, videos, and articles with built-in sharing. Sliders - photos, banners, videos, text, and links. eCommerce - sell goods, digital files, or subscriptions. Social Streaming - sync Facebook, Instagram, Twitter and more to any website. Countdown Timers - count up or down to any time or date. Reviews - display visitor comments, reviews, and ratings. Weather - live forecasts for any location. FAQs - answer customer questions with an accordion FAQ. Popups - messages, sign-up forms, flash sales. Enter the promo code available in the .doc which can be redeemed inside POWr apps. You will receive one year premium access to the POWr Plugin library. Regular updates and email support for pro package. Totally readable blog! You have always inspired me through an informational concept work out. Keep sharing here!